We can store so many things inside of them, there’s often lots of room, they’re extremely useful, and they allow us to walk into a clean kitchen without seeing a huge mess. But after filling up all of those cabinets, it can be a nightmare to open them. Suddenly, your beloved and extremely helpful cabinets go from useful to useless, because of everything that has been put into them. Even though you might think it’s simply because you’re unorganized, it’s likely just because of one thing: your cabinets are only so big, and they run out of storage space pretty quickly. And if your kitchen is anything like mine, then you know that the cup cabinet is one of the most overflowing and unorganized cabinets in the entire kitchen. This is because you only have one cabinet, while you have what seems like hundreds of cups. And the bigger your family is, the bigger that number grows. What you need is not better organizational skills, more cabinet space, or less cups. Instead, what you need is a hanging cup rack. A hanging cup rack allows you to store all of your cups on a mounted wall piece instead of being shoved inside a cabinet. Not only does it save a lot of storage space, but it also keeps your cups organized and provides a nice and charming look to the rest of your kitchen. You can store your everyday plastic cups on a hanging cup rack or all of your favorite coffee mugs. Regardless of what you decide to kick out of your cabinet and rearrange, having a hanging cup rack as your alternative is an extremely smart choice. You won’t have to worry about opening up monstrous overflowing cup cabinets anymore, and you can easily remove and replace cups on the rack without others falling out. So, are you ready to meet your newest hanging cup rack? Here are the best of 2019. Before we jump straight into the list, let’s first talk about the key and essential things you need to know before buying a new hanging cup rack. It’s definitely good to be picky about which products you choose to purchase, but in the end, these 3 things are what will really make a difference between an extremely good and successful purchase and a disappointing one. While these are great guidelines that will lead you in the direction you should go when choosing a hanging cup rack, I highly encourage you to make a list of your own personal requirements for whatever hanging cup rack you will end up buying. The great thing about online shopping is that there are so many options to choose from, but it is also very easy to make mistakes that will end up in a disappointing purchase on the day it arrives. So, to avoid choosing the wrong product, I highly suggest you put these three simple guidelines into practice when shopping for your hanging cup rack. While there’s no such thing as a perfect product, there is such a thing as the right one for you, and I strongly believe that if your hanging cup rack meets these simple but straightforward guidelines, then it will serve you well. 1. Make Sure You Like the Look. I know it is very easy to let practicality, simplicity, and the usefulness of a product win us over into finally buying it. But I highly recommend that before buying a hanging cup rack just because of how useful it seems it will be, to take a moment and observe the way it looks. How will it look in your kitchen? Will it compliment the color of your walls or blend in? Will it be something you enjoy looking at everyday, or is it going to be an eyesore? It might look great in the picture online, but it could look totally different to you once you finally see it hanging on your wall. The last thing you want is to spend your money on something that you hate looking at everyday. If that was the case, then is it really solving your issue of having unorganized and overflowing cabinets? So while these aren’t questions you might ask yourself at first glance, I highly encourage you to do so. It could save you a lot of money and will ensure that the hanging cup rack you receive in the mail truly is the right one for you. 2. Know How Many Cups You Want to Put on it. The second tip I have for you is to take a moment and ask yourself how many cups you actually want to store on your new hanging cup rack. While hanging cup racks are definitely something great to clear out some cabinet space in your kitchen, they likely won’t hold absolutely every cup you have, especially if you have a bigger family. This is why it is important to take some time to predetermine exactly what and how many you want to use on it. Some hanging cup racks fit more cups than others, which is why you need to know how many you want to use beforehand, so that you know which one is more reasonable to buy. I’ve seen a few hanging cup racks that only fit around 6 cups on them, while others fit much more. You don’t want to end up with one that won’t fit near enough the amount you need it to, or one that has too many extra storing options that you won’t use. 3. Be Familiar With Your Options. You might think that the term “hanging cup rack” is pretty generic. But actually, it’s a pretty broad one. What usually comes to mind when you think of a hanging cup rack is a mounted wall piece that has hangers for a few of your favorite mugs and cups. However, there are actually several types of hanging cup racks and you therefore have several different options. For example, one of the hanging cup racks in the list is a deluxe under the shelf cup organizer rack, so it doesn’t mount to your wall, instead it goes underneath a shelf in a cabinet (or wherever else you want to put it). Just because what you typically think a hanging cup rack is doesn’t mean that it will provide you with the functionality you need for your specific cups and cabinets. Instead, be familiar with your options and decide based on your own personal needs and requirements which style suits you best. Now that you know everything necessary about choosing the best hanging cup rack for you, it’s time to introduce you to the best options. What makes these hanging cup racks the best exactly? It’s pretty simple. This is my personal, hand selected list of my favorite 5 hanging cup rack options, and the ones that I strongly believe will meet your needs and serve you the best. I have chosen them based on functionality, customer reviews, and the top three essential guidelines we just talked about. Before we get into the list, it’s important to note that these products aren’t assembled or ordered in any specific way or organization. For example, they aren’t listed from best to worst or cheapest to most expensive. The ordering is pretty random, and each hanging cup rack has its own fair share of pros and cons. Without further ado, here are the best hanging cup racks of 2019. If you’re looking for a cute and charming hanging cup rack for all of your coffee mugs that gets the job done, then I know you’ll absolutely love this one. 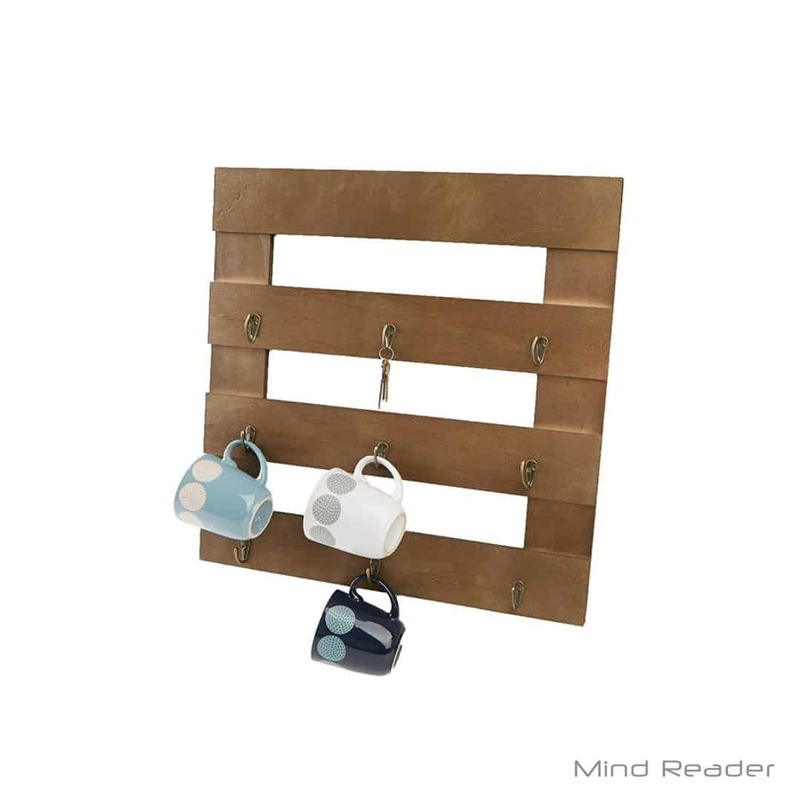 The Mind Reader 9 Hook Brown Coffee Cup Rack is a hanging cup rack that can be easily mounted to your kitchen wall, and it has a lovely natural rustic dark wood look that will look good on almost any wall. 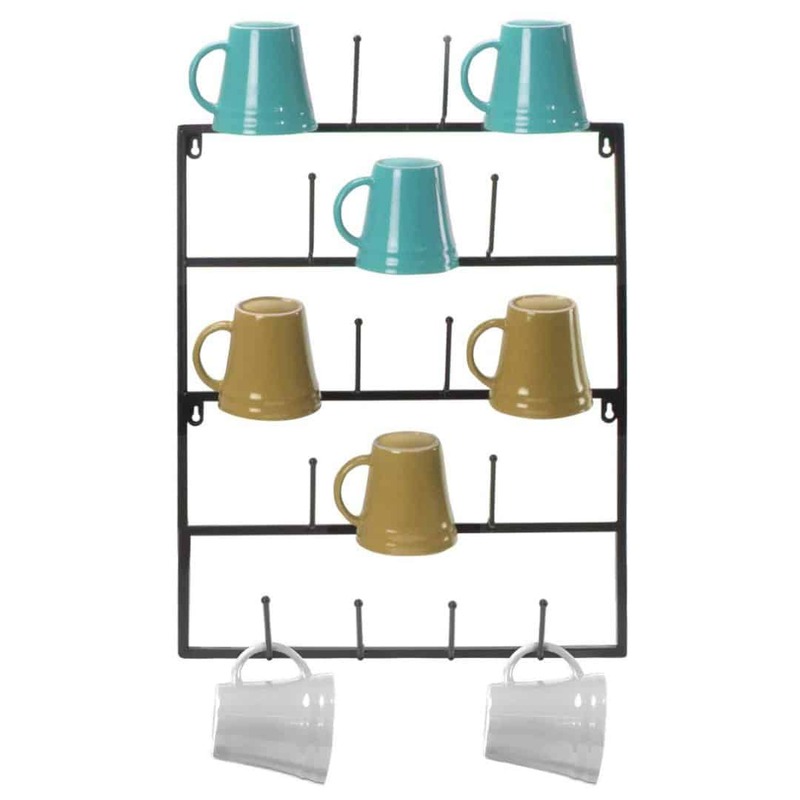 This hanging cup rack consists of 3 tiers, with each tier holding up to 3 cups or mugs. In the end, it can hold up to 9 cups, which should definitely clear out some space in your cabinets! Plus, this hanging cup rack is made up of eco friendly materials, so you won’t have to worry about it harming the environment or your kitchen. If you’re hoping to find the ultimate space saving hanging cup rack, then trust me when I say that you just found it. 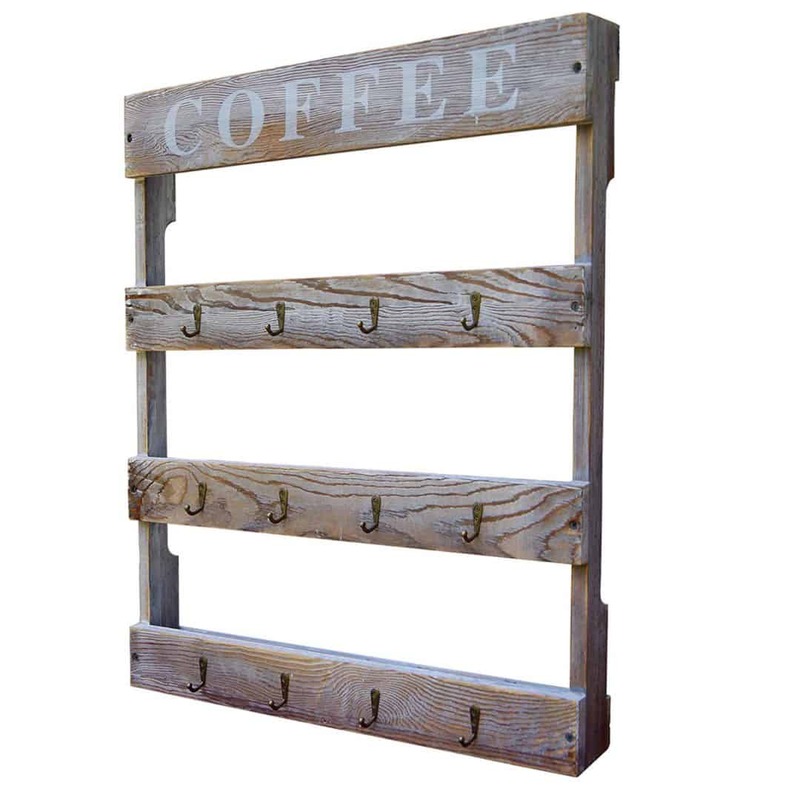 The Large 6 Row Wall Mounted Metal Coffee Mug Rack has extra large spacing in between each of its hooks, meaning that you have even more space to hang all of your favorite glasses, mason jars, and coffee mugs, no matter what size they are. 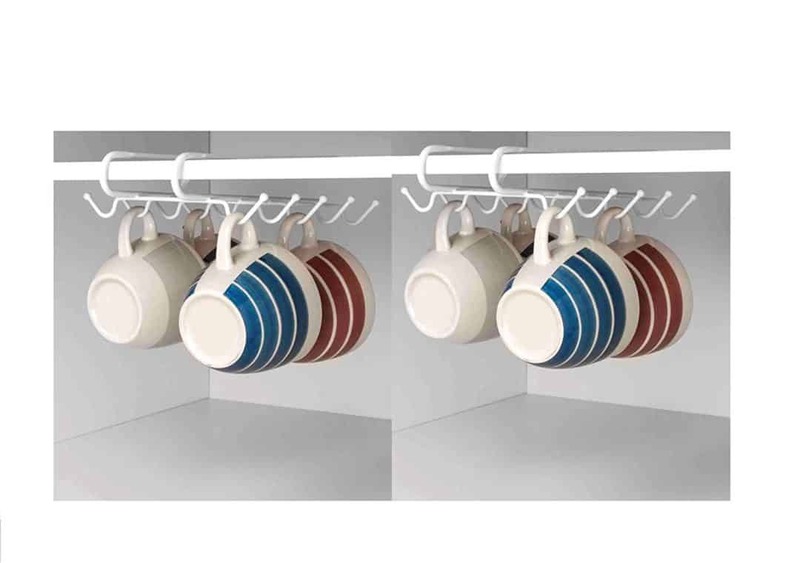 With this hanging cup rack, you have 27 total hanging hooks, which means you can store up to 27 different cups and mugs. If you really want to free up some cabinet space, then the Large 6 Row Wall Mounted Metal Coffee Mug Rack is the way to go. Plus, you can easily mount this hanging cup rack onto your wall, and with a lovely vintage look that can give any home a cozy farmhouse feel. Double up your organization with this hanging cup rack that can fit easily under any cabinet shelf, and comes in a pack of two. 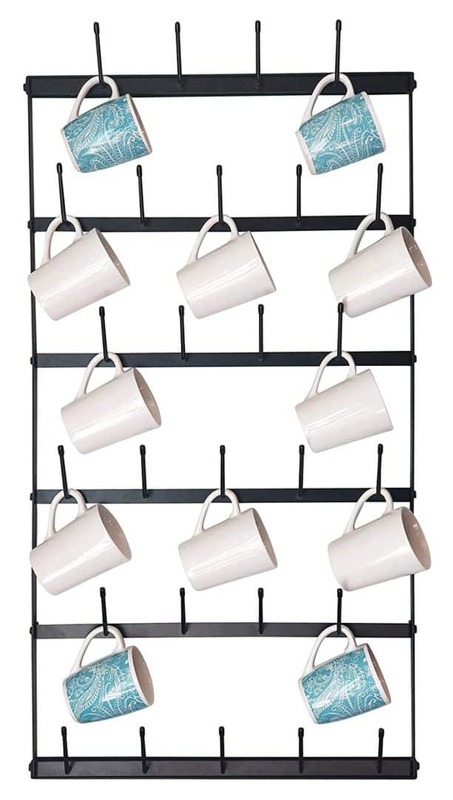 The Deluxe Under the Shelf White 20 Hook Mug Organizer Rack allows you to hang up to 20 different cups and mugs on it, with each rack being able to hold 10 cups each. That means you get extra storage space under your cabinets, plus additional space inside of them. Not only does this under the shelf hanging cup rack give you extremely easy access to all of your cups and mugs, but it’s also super convenient and extremely easy to use. All you have to do is slide it onto your shelf for above storage or below it for underneath storage. The hanging racks also work well for many other things, including closet organization. You can store jewelry, towels, belts, neckties, scarves, and so much more. The possibilities are practically endless when you have 2 super organizational storage racks. Showcase your favorite collection of coffee mugs, tea cups, mason jars, and glasses with a hanging cup rack organizer that will soon become your favorite, too. The Sorbus Mug Rack Cup Holder comes in 5 tiers and can hold up to 18 cups and glasses, while still providing your home with a nice and welcoming look. You can free up so much space with this hanging cup rack, and you won’t have to worry about the hassle it takes to dig through all of your cabinets looking for the right glass or cup. You can ensure that this hanging cup rack will stay with you for a long time, as it is made of extremely sturdy materials. Its solid iron build gives it an incredible amount of durability, and the black coated finish gives it a nice finishing look. The last but definitely not least hanging cup rack of 2019 is the DewBrew 12 Hook Rustic Coffee Cup Holder, and it is by far one of the best out there. This hanging cup rack can hold up to 12 different coffee mugs and glasses, each tier with a generous amount of spacing so that you don’t have to worry about mugs and cups colliding into one another. Plus, the structure is built with extremely durable materials, and the solid metal allows you to display your best coffee cups and glasses with confidence. Now that you have seen several of my top picks for hanging cup racks, decide which one is best for your kitchen storage needs and take action.